The Blacktip Shark is considered one of the most beautiful sharks in the Ocean. They are found in warm coastal waters around the world. This species prefers shallow waters so it is seen often by divers. Occasionally, they can also be found in estuaries and brackish water. Their scientific name is Carcharhinus Limbatus. These sharks have pointed snouts and black tips on their fins. They are sometimes spotted above the water. They leap above the surface, rotate several times, and splash down on their backs. 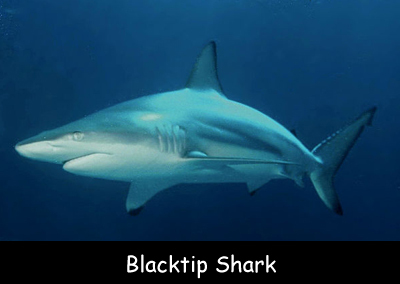 Black tip sharks needs to keep swimming to prevent suffocation and sinking because they do not have swimming bladder. Their diet comprises of various types of fish along with large crustaceans, snails, octopuses, stingrays and squids. This stocky shark is dark grey to brown on top transitioning to white underneath. These sharks can reach up to 8-9 feet approximately in length and 66 to 200 pounds in weight. Blacktip Sharks are unlikely to attack human beings without being provoked. These sharks are known to eat the young of other sharks including dusky sharks and some cephalopods. Their flesh is used fresh, dried or salted for consumption, hide is used for leather and liver for oil. Females have a gestation period of around 10 to 12 months. On an average, they can survive up to 12-13 years in the wild. Declan, Tobin. " Fun Facts for Kids about Blacktip Sharks ." Easy Science for Kids, Apr 2019. Web. 21 Apr 2019. < https://easyscienceforkids.com/blacktip-shark/ >.